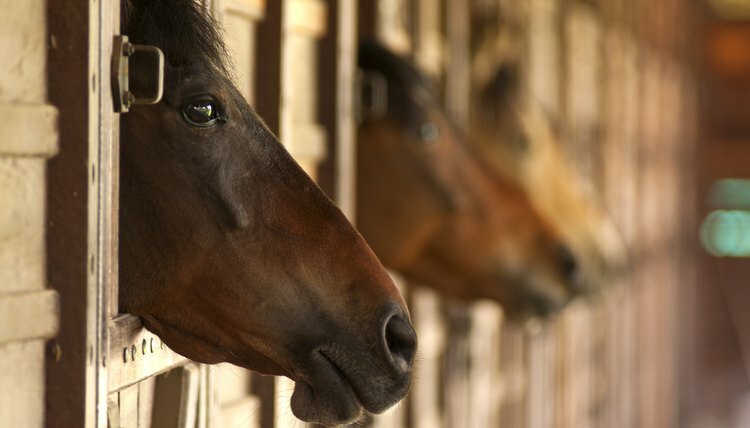 Kidney disease in horses is fairly uncommon. Equine kidneys are quite efficient, but they can break down over time. Signs and symptoms of kidney disease can be vague when chronic until the condition is quite serious, but are more obvious in cases of acute kidney failure. Kidney disease can result from exposure to toxins or medications used to treat other ailments. A horse's kidneys filter waste products from his blood, and if they aren't working properly, that waste can build up to toxic levels. Your horse's kidneys sit on either side of his spine, just behind the saddle area. They are protected by a layer of fat, bone and muscle. Tiny nephrons do the actual waste cleaning, and only about a quarter of the millions of these miniscule kidney units are active at any time. If your horse suffers a bout of colic or colitis, it's possible that common drugs used to treat the conditions can cause kidney damage. These include nonsteroidal anti-inflammatories and certain antibiotics. Acorn consumption and exposure to heavy metals such as lead or arsenic also can result in kidney failure. Toxic plants eaten in the pasture can cause kidney issues, as can severe trauma. Acute kidney disease occurs suddenly, rather than gradually as in the chronic type. Badly dehydrated equines can suffer acute kidney failure, as can those suffering from shock, whole body infections, heatstroke or hemorrhage. General anesthesia in a horse undergoing surgery can trigger acute kidney failure. The majority of horses with acute, rather than chronic, kidney failure can recover with treatment. Your vet likely will provide your horse with intravenous fluids. Dietary management is crucial as well. Until your horse recovers, feed him only grass hays and little or no grain. Thoroughly soaked beet pulp can prove a suitable alternative to grain until his kidneys function normally again. By the time a horse develops clinical signs of chronic kidney disease, it's likely he's had the condition for years and his kidneys are pretty far gone. Signs of chronic kidney issues include weight and appetite loss, dull coat, excessive water consumption and lethargy. As the disease progresses, the horse might urinate very little. His chest area above his front legs might swell up. Because waste materials are building up inside his body, intestinal and oral ulcers can occur, along with excess tartar deposits on the teeth. While chronic kidney disease isn't curable, with treatment your horse might live comfortably for months or even years. Treatment includes feeding grass hays rather than calcium-rich legumes such as alfalfa, and supplementation with omega-3 essential fatty acids. Your vet should perform regular blood tests to monitor your horse's creatinine levels, which helps assess kidney health. Supply your horse with a salt block, which can encourage water consumption. Of course, the horse always must have access to fresh, clean water. If you live in a cold climate, that means ensuring that water buckets or tubs don't freeze over for any length of time in winter. That might mean more frequent trips to the barn in subfreezing temperatures to break the ice and fill buckets, or installation of heated, automatic waterers.